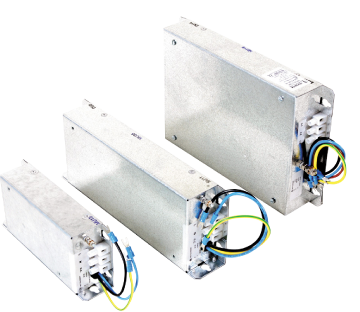 EMC filters reduce the transfer of electromagnetic noise between the drive and mains power supply. All Optidrives are fitted as standard with an internal EMC filter, except where specified by the customer, and for most industrial applications, this will be sufficient. In the event that a higher level of filtering is desired or required, the external EMC filter can be added to either a drive which already has the internal EMC filter, or a drive without EMC filter. Best performance is achieved by using a filtered drive and the appropriate external EMC filter.